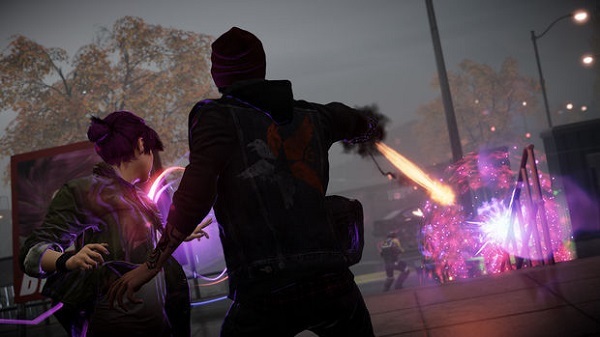 inFamous: Second Son is the hotly anticipated third title in the critically acclaimed series of titles from Sucker Punch. 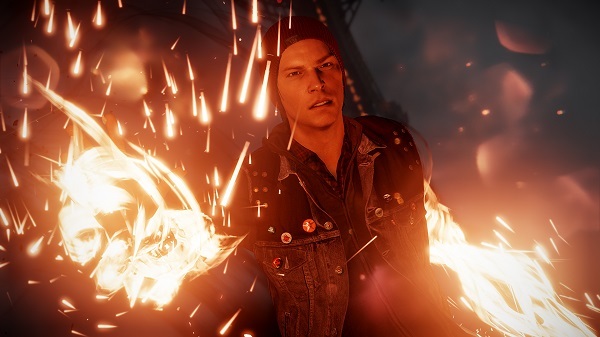 Gone is series protagonist Cole, replaced with a younger and more eager Delsin Rowe. Set several years after what Sucker Punch determined was the common ending for inFamous 2 which saw Cole wipe out himself and most conduits in a near radius. You see conduits are different from us regular folk. They can harness special abilities that make them all maner of superheroes. But like regular people, some of them are still dicks. In the months leading up to the events of the game conduits have been rebranded as Bio-Terrorists and are hunted by government backed forces. The DUP (Department or Unified Protection), the force hunting and locking up the so-called Bio-Terrorists, is headed up by a conduit called Brooke Augustine. Our story starts as a DUP prisoner transport crashes just outside of the sleepy reservation that Delsin and his brother Reggie, the local sheriff, inhabit. Delsin was happily spending his day spray painting some signs and generally nudging the boundaries of being a delinquent, when all hell breaks loose. He grabs for a conduit that can make smoke appear from this hands only to suddenly get a flashback montage of the conduit’s life. When Delson awakens moments later he’s discovered his own conduit power – the ability to leach powers from other “pure” conduits. After things go down in their town Delsin convinces Reggie to come with him to Seattle to locate Augustine, obtain her power to heal their tribe, and find out more about Delsin’s new powers. Ok, so story wise we’re not going to be looking for it at the BAFTA awards next year, but, it does make a wonderfully pulpy comic book mash-up and that’s what the inFamous series has lived on in previous incarnations. With previous titles the general tone of the game has been a little gritty and dour. Cole was a wonderful character, deep and interesting and riddled with angst and remorse. The trouble is it made him a real killjoy most of the time. He never really seemed to embrace and enjoy the powers given to him, which in turn made the player experience a little muted. No such thing with Delsin. He’s super pleased to have these new abilities and you get ample chance to show them off. Starting with the Smoke ability you can control Delsin as you would most other third person action platformers. You can run, jump, climb up ledges and even traverse up buildings just as you might in something like Tomb Raider, Uncharted or Assassin’s Creed. 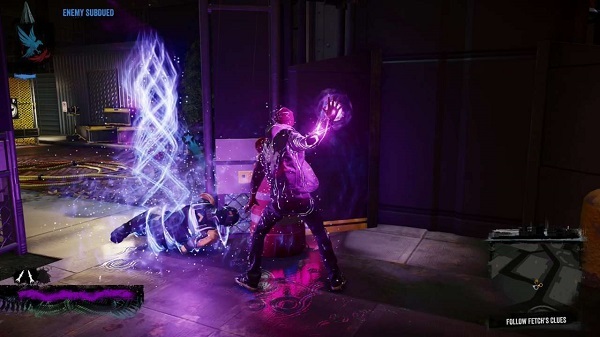 You then add the special abilities Delsin has and things get interesting real fast. Left trigger will furnish you with you standard zoomed reticle and a pull on the right trigger will fire whatever projectile is associated with your currently equipped ability. I say currently equipped because you trigger your collected abilities by draining the resource they use from the environment. For example draining smoke stacks or smoldering vehicles will replenish/activate your smoke powers. Or draining Neon from signs, your second power, will switch you to that power. There’s no way to “stock up” on these elements and switch between them – you only use the power currently “in stock”. This can be a little frustrating and it’d be nice to easily swap and change between these abilities at will. Back on the control front then and the other face buttons can produce varied other effects. Using O for example could make you do a smoke dash or perform a super fast neon run (which you can do over every surface but water – this includes streaking up the side of tall buildings in seconds). Triangle is usually context sensitive and mostly used to peacefully (well.. ‘ish) subdue antagonists for good karma points. You can also use O and take people out and ear bad karma points. Yes, as in the previous titles, moral choices are presented constantly throughout the game. Not only do you get the choice to either subdue or kill surrendering enemies but you have the ability to play out some key plot moments in either and “evil” or “good” way too. These points serve as a good excuse to play the game one way then replay it another – there is nothing to be gained from not committing to one or the other as staying sort of neutral will not unlock any of the upgrades you’ll need. Talking of upgrades there are several per ability type. These range from simply being able to drain your power’s source faster to providing more projectiles or better means of traversal. Each ability costs a certain number of blast shards. Shards can be collected throughout the world from flying surveillance bots, hand scanners and taking down DUP control points in each of the cities zones. Throughout the city each zone will have a DUP control point, a secret agent mission , a missing audio log, a secret camera, overt cameras, several flying surveillance craft, murals to paint and DUP hand scanner locations. These all form the side missions that you can delve in to as and when you fancy a break from the main story quests. Most are no more than 1 – 2 minutes each with the only exception being the DUP control point takedowns which, at later stages, take a sizeable amount of chipping away to take down. Side missions can get a little shallow and feel a little soul-less compared to some of the ones in the previous games. That said it was enjoyable enough to 100% the game on my first run through. As you chip away at the total DUP control percentage of a zone people will start to cheer you on and see you as a man of the people rather than this scary Bio-Terrorist that the DUP portray. Reach 30% or less and you can make a phone call and take on the zone showdown. Win the showdown (usually consisting of several DUP forces and vehicles) and the zone will no longer be under DUP control meaning you get some unlocks and the ability to fast travel to the area. You can then take the total control down to 0% for even more goodies. Graphically inFamous: Second Son is stunning. Really, truly a work of art in motion. The animation is wonderful and smooth. The sheer audacity of the environmental scale is mind blowing. The amount of detail that Sucker Punch have crammed into an open world game is second to none. Add to that a super effective world lighting model – the game changes time of day frequently), some incredibly high resolution texture work (seriously even the ground looks gorgeous with small divots and curvatures and some of the most realistic facial animations ever and you have a showcase for the PS4 that can’t be matched… on any platform. Frame rate is mostly solid with Sucker Punch pitching the game at 30fps. The frame clock is unlocked so this can be slightly higher than 30fps and at some extremely active scenes this can also dip a little too – I think I maybe spotted this a couple of times. Particle effects too, hell all the bells and whistles added, look stunningly good. Get Delsin draining some neon from a sign on a rainy wet street at night and it looks stunning.. truly. Sound design is equal to the high bar set by the graphical prowess of the game. Dynamic scores add greatly to this with the music always adapting and suiting the mood perfectly. Voice work is well produced and a great cast of voice actors breathe life into the comic book tail. Troy Baker is quickly becoming as prolific and bankable as Nolan North. Longevity isn’t bad either with a main playthrough as karmically good coming in at around 15+ hours with a 100% clear rate. That might seem a little lean to some but as ever the inFamous series lends itself incredibly well to at least a second playthrough to experience the other karmic route. 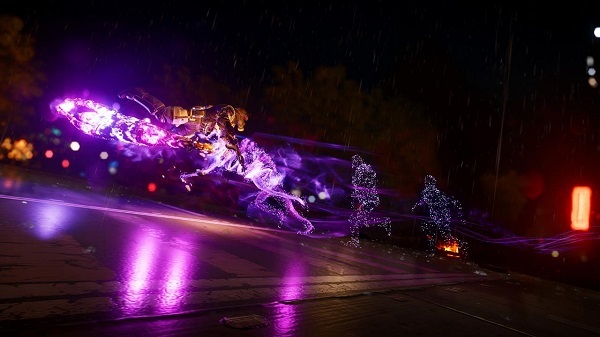 There are a few niggles with inFamous: Second Son though that stop it from reaching legendary status. The initial smoke powers feel a little weak making combat a touch frustrating in the early hours of the game even after unlocking some of the power-ups. Side missions can become monotonous and I found I did leave a smattering of them until after the credits had rolled and I found myself back in Seattle. Taking some of the later DUP control points in the game can also feel like a frustrating chore and chip away at your feeling of being this bad arsed superhero as you’re taken out once again by one grunt with a machine gun. Also being forced to use a certain power at key moments in the game were super frustrating, especially as the power forced upon you is a weak one. 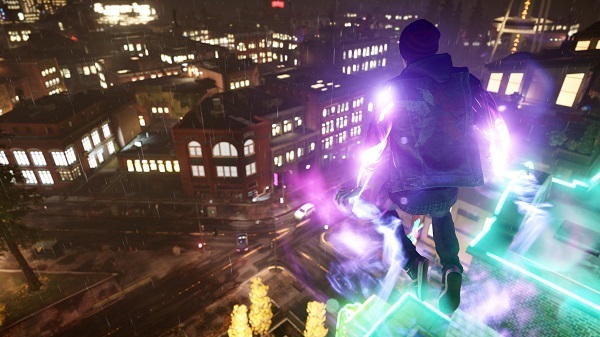 inFamous: Second Son gets almost everything right. Sure, it lacks a little substance compared to previous titles, but that’s to be expected from a launch window (just about) title that is still finding it’s feet technically. It also suffers from a smattering of slow-down, pop-in and monotony in the side-missions coupled with that lacklustre smoke power at the start. That said I loved almost every moment with the game and had no issue what-so-ever in starting a second playthrough immediately after finishing my first. As an inFamous fan I couldn’t have really asked for more on this first outing. inFamous: Second Son is a superb game. A jaw dropping, show stopping showcase for the power of the Playstation 4 console and a triumph for Sucker Punch. The PS4 just got its first essential first-party game.